At times you may have source of foreign movie videos, like India Musical film and Japanese anime. If some of them lack of your native language subtitle, then you will probably drop them to the corner. Actually, you can attach your preferred language to the movie files, play and watch them with understandable speaking. Adding movie subtitle is easy to achieve with the help of Handbrake. WinX DVD Ripper Platinum - the best Handbrake alternative 2018 for DVD ripping - is able to rip nearly any copy-protected DVD to digital files with desired inherent subtitle or external SRT subtitle. Step 1 - Search and download you preferred subtitles. First of all, you need to find your language subtitle from website. Though there is no 100% guarantees of availability, you still have great chances to get you desired language subtitle after an easy search on Google. Best subtitle file searching method: "movie title" + "your preferred language" + "subtitle" as the search strings. The raw subtitle file you downloaded is actually text files with time codes. It tells the movie to display a certain text at a specified time. Two of the most common formats for subtitle files are ".srt" and ".sub". Using a common media player like Quicktime or VLC to play the movie, you can also display subtitles simply by putting the subtitle file in the same folder. The only requirement is that both the movie and the subtitle files should go under the same name but with different extensions. Something like "title.avi" and "title.srt". Using this approach, you can select the language to display by changing the subtitle file inside the folder. But the method will not be effective if the movie file is edited as the subtitle will appear at the wrong time. The latest version of Handbrake 1.0.7 - the 64-bit build - continues to own the feature named soft subtitles. This ability allows users to add subtitles as a part of the movie with the option to turn the subtitle on and off. Something like DVD movie subtitles. Step 3 - Open Handbrake and choose the source. Open HandBrake, and then you will see a Source Selection in the left. Click File to browse and open the movie you want to add external subtitle. Next, Handbrake will begin scanning the file. Once finished, define destination and output preset based on your own needs. 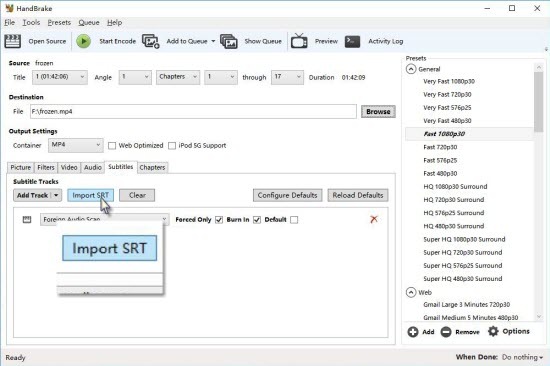 Step 4 - Open the Subtitles tab and click "Import SRT" button. At this step, you need to choose the SRT subtitle you downloaded before and load it into HandBrake. Then, click "Start Encode" at the top menu of HandBrake to attach the subtitle to your movie. Now you have finished all steps of attaching subtitle to movie videos by Handbrake. After this simple operation, you can play foreign movie videos with home language. If Handrake can't deliver digital copies with desired subtitles from copy-protected DVDs, you can try WinX DVD Ripper Platinum as a replacement. This tool can decrypt encrypted DVDs (including Disney 99-title DVDs, workout DVDs, etc.) and convert them to MP4, AVI, WMV, MOV and other formats with wanted inner subtitle track or external subtitle. How to add external subtitle to copy-protected DVD? First of all, download WinX DVD Ripper Platinum on your computer. 1. Insert target DVD into DVD drive and click DVD Disc button of WinX DVD ripper to load the disc you just added. 2. Choose an output profile based on your own needs. 3. Click Edit and move to Subtitle tab, check the Enable Subtitle and choose Extra. Then, click Add to select the SRT subtitle you downloaded online or received from friends. 4. If nothing to change, hit RUN to begin ripping the copy-protected DVD. Once finished, you will get a digital copy with the subtitle you added with this Handbrake alternative.